Greenlight Planet has launched a pay-as-you-go (PAYG) platform, the Sun King™ Eco Easy Buy, to enable low-income customers purchase its solar lamps in instalments over a period of 10 weeks. 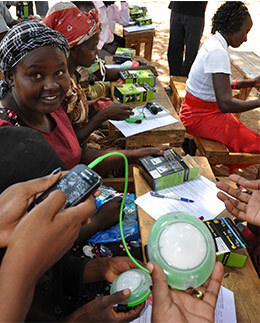 Greenlight Planet is using a mobile payments platform developed by Angaza Design to enable customers who cannot purchase solar lights upfront, pay a modest deposit of $2.75 towards the purchase price, and thereafter pay one dollar every week for a period of 10 weeks in order to fully own the product. “Most of our customers earn less than $2 a day and have very little disposable income. Some are dependent on daily wages that are used to purchase basic necessities including kerosene, mobile phone airtime and food in small increments. We needed to find an alternative to up-front payments that fit this purchasing pattern,” says Anish Thakkar, CEO and co-founder of Greenlight Planet. Greenlight Planet begun piloting the Sun King™ Eco Easy Buy lights using the PAYG model in January 2015. According to Lesley Silverthorn Marincola, CEO of Angaza Design, the company’s PAYG platform capitalizes on trends in mobile phone and mobile banking infrastructure to remove the upfront price barrier to solar and other modern sources of energy. Angaza enables customers to access clean energy by making pre-payments using ‘mobile money’ in much the same way prepaid airtime tokens are used. This removes the dreaded burden of taking and servicing traditional bank loans in purchasing goods. The customer takes home the product ready for use upon making the down payment. But they must make their weekly payments to keep the product activated. Late payments result in the lamp being automatically deactivated. On completion of all due payments, the product is “unlocked” and fully released to the customer, making subsequent use completely free. Greenlight Planet says more than 3 million households in low-income communities in areas not connected to grid electricity use its Sun King™ line of solar home lighting solutions which range in price from $10-$100. The Greenlight Planet solar lighting products all meet the Lighting Global Quality Standards.